Hi, friends! I hope you guys had an awesome weekend and are ready for my second "Mmm...Monday" post! Another easy recipe packed with protein and perfect for any veggie hater. All you have to do is stuff some peppers with ground turkey, a few vegetables, and quinoa, and then put them in the oven. Seriously? YES! First off, what is quinoa (qwee-no-ah)? Haha! Although it is commonly pronounced this way, it is really pronounced (keen-wa). Quinoa is derived from the seed of a plant that is related to the spinach. It is great for my vegetarian friends, because it has a significant amount of protein (6 g. in one serving of 1/3 cup! ), and for my gluten sensitive friends (it is gluten-free!). 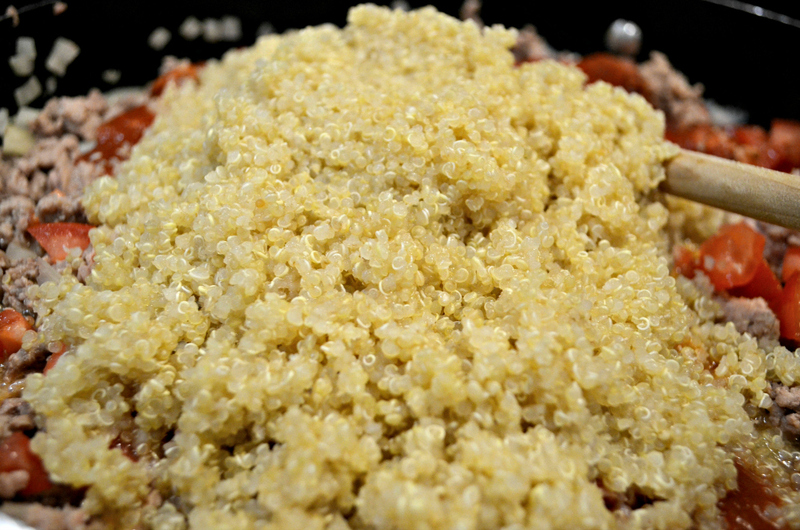 Quinoa seeds contain essential amino acids that our bodies cannot make and need for growth and maintenance of health. One in particular is lysine. Most grains lack this essential amino acid. Quinoa has lysine, along with all of the other essential amino acids, which makes it a complete protein like meat, fish and eggs. It is also an excellent source of phosphorus, iron, and vitamin B6 (energy--wooo! ), and a good source of fiber and riboflavin. Read on, if you want in on this super food! 2. Rinse the quinoa thoroughly by using a strainer. This will help to get rid of the saponins on the outside of the grains that give it a bitter taste. Place quinoa and water in a small saucepan and bring to a boil. Reduce the heat to a simmer, until the water is absorbed (10-15 mins.). The grains will appear translucent, and the outer germ will separate. 3. Slice the tops off the peppers and remove the membrane and seeds. Bring the water in the pot to a boil. Cook the peppers for 5 minutes. 4. Chop the tomatoes, onion, and parsley. Mince the garlic. 5. Set a large pan over medium-high heat. Add a drizzle of olive oil, the turkey, and minced garlic. Sprinkle with salt and pepper. Then, add the tomato sauce and tomatoes. While stirring with a wooden spoon to break up the pieces, cook until browned (5 to 7 mins.). 6. Once the turkey is browned, turn off the heat and fold in the quinoa. Mix all of the ingredients. Add more salt and pepper, if needed. 7. Set the peppers on a baking dish and stuff each pepper with filling. Place in the center of the oven and bake for 30 minutes. When the peppers are tender and cooked through, sprinkle cheese on the top. Turn on the broiler and cook for 2 minutes. 8. 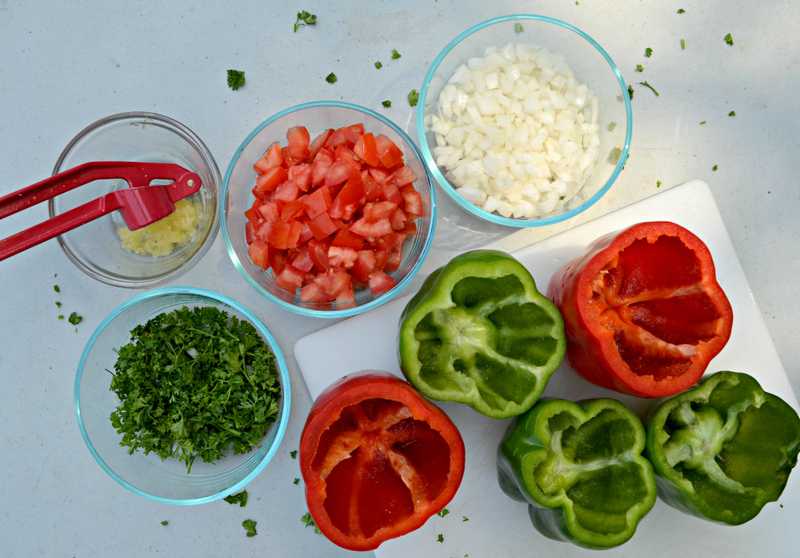 Remove the peppers and garnish with parsley sprigs.